So, how do you make a Palmpring mattress from these materials? Over the past few weeks, we’ve explored how to turn raw rubber tree sap and coconut fiber into the incredible materials inside Palmpring mattresses. Now that we understand each of our materials individually, we need to understand how they fit together. 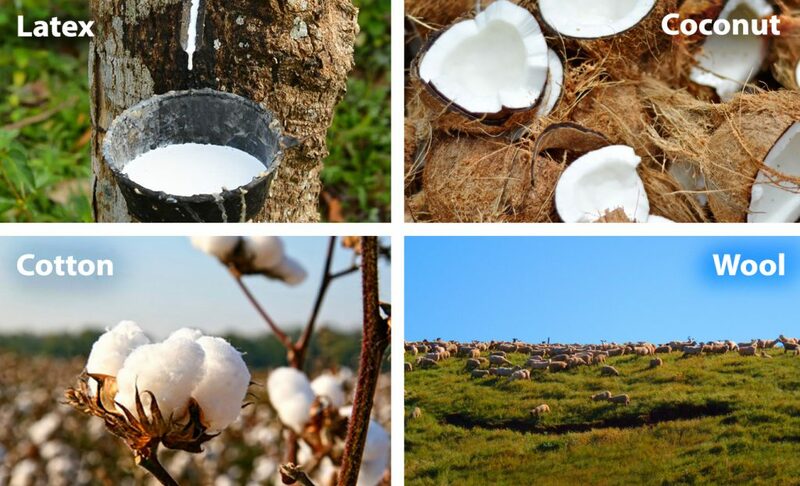 How do you make a mattress using only cotton, wool, latex, and coconut fiber? Read about making Organic Coconut Coir here. Read about making 100% Certified Organic Latex here. After being gathered and processed, our latex and coconut is turned into 2-inch-thick layers ready to be put inside a mattress. But, not every Palmpring mattress is the same. Some people like a very soft, cushioning mattress while others like solid support for their back and joints. Our solution is simple, adjust the arrangement and ratio of coconut and latex. 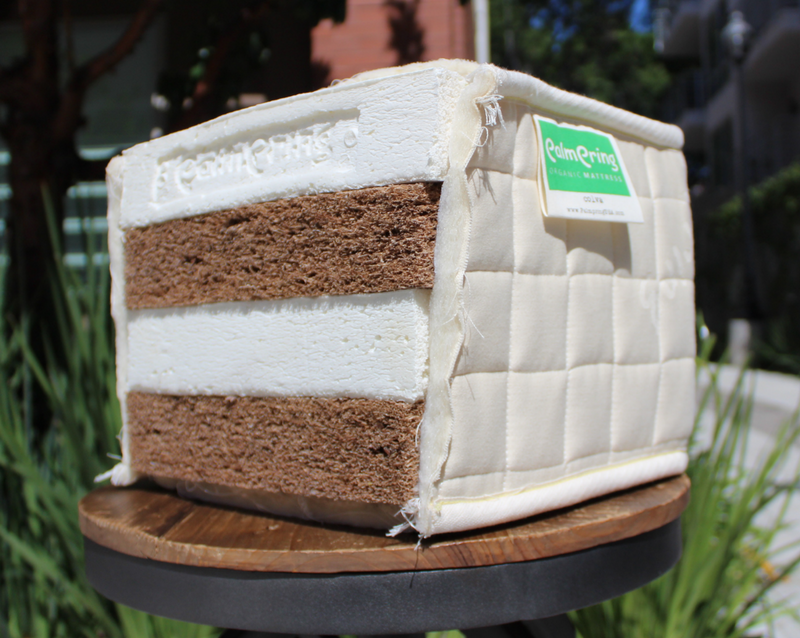 Our organic latex layers act as a soft cushion while our coconut coir layers provide firm support. 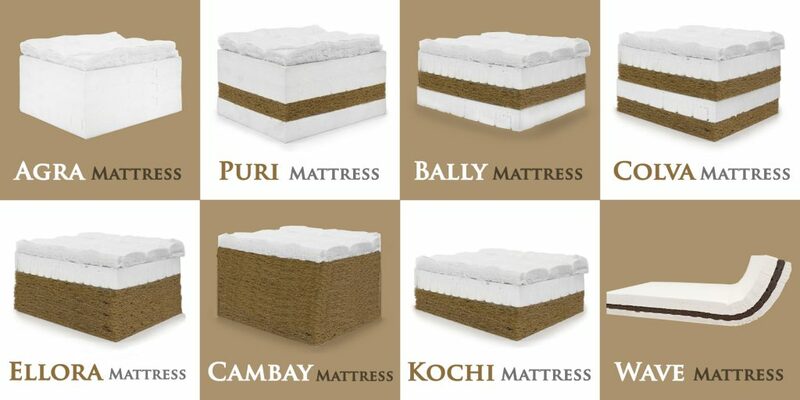 Our most supportive mattress is Cambay, made with 3 (2 inch) layers of coconut coir and no organic latex. Our softest mattress is Agra, made with 3 layers of latex and no coconut fiber. The many comfort levels in between are achieved by alternating coconut and latex layers, like a cake. Bally is 1 layer of coconut in between 2 layers of latex. Colva adds an extra layer of coconut coir to the bottom of Bally for extra support. Puri adds an extra layer of organic latex to the top of Bally for additional cushion. Ellora consists of 2 layers of coconut with a layer of latex on top. Now that we’ve chosen the perfect comfort level for you, what’s next? Once we’ve decided the right ratio and arrangement for our coconut and latex layers, its time to sew on a mattress cover. At Palmpring, our mattress covers are made with all natural cotton and wool. Wool is naturally flame retardant, allowing us to meet safety standards without the use of toxic flame retardant chemicals. Learn more about mattress flame retardants here. The mattress cover is ½ inch thick on all sides, adding an extra inch to the total height of the mattress.